And A Player To Be Named Later: Shocked!! I Am Shocked!! So Sammy Sosa tested positive for steroids. Really, is anyone out there shocked by this? The guy who said he used his corked batting practice bat "by mistake." The guy who was described as "lanky" and "skinny" when he first came up and who gained weight and mass, and then strangely broke down towards the end of his career? Is anyone shocked at all? And we know how this is going to go from here. "I thought it was flaxseed oil." Or, "It was my wife's steroids." Or "I didn't know when I bought it over the counter that it was illegal." Or some such. "I assure you that I will not answer nor listen to rumors. If anything ugly comes up in the future, we will confront it immediately, but with all our strength because I will not allow anybody to tarnish what I did in the field." Add to that, the fact that Sosa lied to Congress about taking performance-enhancing drugs, and you have a man who is screwed. The Federal Government doesn't like to be lied to under oath. It gets kinda persnickety about things like that. Ask Barry Bonds. And you know what else is going to happen. Sosa will have his defenders. Yes, he will, much like he did when his bat sprayed cork all over the baseball field. Reporters and talk show guys and bloggers who will say: "Everyone was doing it." Or "You can't really prove anything." Or whatever. Hell, one week ago, Rob Guerrera of ESPN defended Sammy with this bit of impenetrable logic: "If Sammy was doing steroids at that time, would he really need the corked bat?" And this: "If you're one of those high and mighty voters who is paralyzed by steroid suspicion, I'll never be able to convince you to take the stick out, let alone cast your vote for Sammy Sosa." What a difference a week makes. But back then....aw, heck. You remember the lovefest the world had for Sosa back then. America fell in love with his chest-pounding, his kisses to the camera, his home run hop. So did the press. They ignored his ever-swelling biceps and chest and took his ego for "charm." They overlooked his contract complaints. His walking out of the Stadium before a game because he was dropped in the batting order. His childish fights with his manager. His overall moodiness. They just took it as "Just Sammy being Sammy." 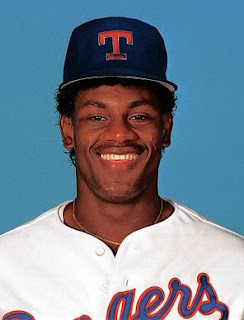 If another played had said, "I will calmly wait for my induction to the Baseball Hall of Fame. Don't I have the numbers to be inducted?" the press would have taken it as arrogance. Not Sammy. Well, no one can ignore this now. Sosa and his defenders will have to speak to this. But whatever will be said—and you know it will be truckloads—one thing remains: Sammy Sosa cheated. Sammy Sosa got caught. When I the little ticker announcing this at the bottom of ESPN yesterday, I though, "Wasn't he already named?" I guess I'd just always assumed he'd been using, especially after McGwire was pretty much implicated. 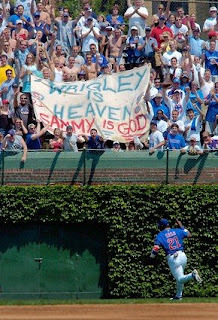 Oddly I think there will be less defenders of Sammy than there has been for Bonds or Arod. Uncle Bud better find out who is leaking these names and stop it...or let all 103 names out. What are we, about 3 months away from the next name "leaking" out? 30% of the AL and NL leaders have been connected to PED one way or another (not necessarily proof in 2003 though). Others on that list could easily be suspected from Boone, Delgado, Thome, Lopez, Sheffield, & Bagwell. Yeah, it is weird that they got A-Rod's name just before the book came out. And then they got Sammy just as he announced his retirement. Coincidence? I dunno, but it is sad.